​While working as the executive director of Oms Art, Sei Ryun Chun is an active artist herself. For over twenty years, she has been a devoted supporter of community, encouraging art and culture to all generations. Her works have been exhibited around the world, including Korea, Italy, France, Germany, and the United States. Her works represent abstract expressionism. Her artworks are not limited to any specific media. knitting, painting, and tea making. 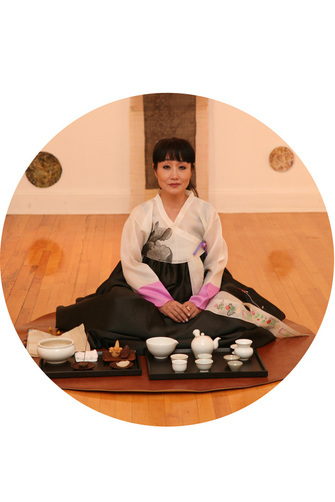 Sei is also a Korean traditional tea ceremony performer. to hold tea ceremony lessons at her house today. Sei has a long experience as a tea instructor. Sei has established the Korean Tea Lovers Society and was the Vice president of the organization. She has performed tea ceremony in Hamond museum and taught tea classes in many public high/middle schools. Sei was the very first person to open a Traditional Korean Green Tea House in Old Tappan, NJ in 2004.
to share their works in the public. She has been, and still is, arranging exhibitions for young artists every month. Korean-American artists promoting opportunities to the public and art world in the New York Metropolitan area. Sei has held over a hundred exhibitions and has successfully exhibited at the NY Art Fair, Miami Art Fair, and the SF Art Fair. 2018 Korean Thanksgiving Festival in U.S. Botanic Garden, D.C.